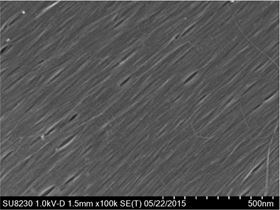 This scanning electron microscope image shows highly aligned and closely-packed carbon nanotubes gathered into a film by researchers at Rice University. Image: Kono Lab/Rice University. Using a simple filtration process, researchers at Rice University have managed to create flexible, wafer-scale films of highly aligned and closely-packed carbon nanotubes. With support from scientists at Los Alamos National Laboratory, the Rice University researchers have developed a process for making inch-wide films of densely packed, chirality-enriched single-walled carbon nanotubes. In the right solution of nanotubes and under the right conditions, the tubes assemble themselves by the millions into long rows that are aligned better than once thought possible, the researchers report in a paper in Nature Nanotechnology. The thin films offer possibilities for making flexible electronic and photonic (light-manipulating) devices, said Rice physicist Junichiro Kono, whose lab led the study. Think of a bendable computer chip rather than a brittle silicon one, and the potential becomes clear, he said. "Once we have centimeter-sized crystals consisting of single-chirality nanotubes, that's it," Kono said. "That's the holy grail for this field. For the last 20 years, people have been looking for this." The Rice lab is now closing in on this goal, although the films reported in the current paper are ‘chirality-enriched’ rather than single-chirality. A carbon nanotube is a cylinder of graphene, with its atoms arranged in hexagons. How the hexagons are turned determines the tube's chirality, and that determines its electronic properties: some are semiconducting like silicon, and others are metallic conductors. A film of perfectly aligned, single-chirality nanotubes would have specific electronic properties. Controlling the chirality would allow for tunable films, Kono said, but nanotubes naturally grow in batches of random types. For now, the Rice researchers use a simple process developed at the US National Institute of Standards and Technology to separate nanotubes by chirality. While not perfect, it was good enough to let the researchers make enriched films with nanotubes of different types and diameters, which could form the basis for terahertz polarizers and electronic transistors. The Rice lab discovered the filtration technique in late 2013 when graduate students and lead authors Xiaowei He and Weilu Gao inadvertently added a bit too much water to a nanotube-surfactant suspension before feeding it through a filter assisted by vacuum. The film that formed on the paper filter bore further investigation. "Weilu checked the film with a scanning electron microscope and saw something strange," explained He. Rather than drop randomly onto the paper like pickup sticks, the nanotubes – millions of them –came together in tight, aligned rows. "That first picture gave us a clue we might have something totally different," He said. A year and more than 100 films later, the students and their colleagues had refined their technique to make nanotube wafers up to an inch wide (limited only by the size of their equipment) and of any thickness, from just a few nanometers to hundreds. Further experiments revealed that each element of the production process mattered: the type of filter paper, the vacuum pressure, and the concentration of nanotubes and surfactant. The process worked with nanotubes of any chirality and diameter, but each required adjustments to the various elements to optimize the alignment. The resultant films can be separated from the paper and washed and dried for use, the researchers said. They suspect that the process would also work with multi-walled carbon nanotubes and non-carbon nanotubes like boron nitride. Co-author Wade Adams, a senior faculty fellow at Rice who specializes in polymer science, said the discovery is a step forward in a long quest for aligned structures. "They formed what is called a monodomain in liquid crystal technology, in which all the rigid molecules line up in the same direction. It's astonishing. (The late Rice Nobel laureate) Rick Smalley and I worked very hard for years to make a single crystal of nanotubes, but these students have actually done it in a way neither of us ever imagined." Why do the nanotubes line up? Kono said the team is still investigating the mechanics of nucleation – that is, how the first few nanotubes on the paper come together. "We think the nanotubes fall randomly at first, but they can still slide around on the paper," he said. "Van der Waals force brings them together, and they naturally seek their lowest-energy state, which is in alignment." Because the nanotubes vary in length, the researchers suspect the overhangs force other tubes to line up as they join the array. The researchers also found that their completed films could be patterned with standard lithography techniques. That's yet another plus for manufacturers, said Kono, who started hearing buzz about the discovery months before the paper's release. "I gave an invited talk about our work at a carbon nanotube conference, and many people are already trying to reproduce our results," he said. "I got so much enthusiastic response right after my talk. Everybody asked for the recipe."